(Slot Game) was released in 2002 by Playtech. The game contains 5 reels and 5 paylines. The graphics of the game are bright and colorful detailed texture and art style and are based on the Share Trading Theme. 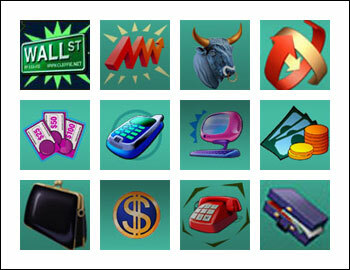 The symbols of the game are theme oriented and include Bull, Computer, Briefcase, Red Phone, Cell Phone, Coin Purse, Tickets, Chips, and Dollar Sign. The highlight of the game is its Progressive Jackpot.Jackpot : This game features a Progressive jackpot which means that Jackpot is a constantly accumulating prize. The current value of the Progressive Jackpot is displayed on the game screen; the value of the Progressive Jackpot is displayed in credits, not coins. To qualify for the global Progressive Jackpot, the player must wager the maximum bet of Five coins per spin. If the player is playing the Progressive Jackpot, and that gets five Wall St. Fever Sign lines up on the payline, and the maximum bet has been wagered the Progressive Jackpot is won. Jackpots are hit on an average every one and a half month. The game has set of 5 reels and 5 paylines. The coin size denomination a fixed value at 0.10 per line bet, and can be wagered upto 5 coins. The minimum bet amount is 0.10 and the maximum bet amount is 0.50 per spin. The Jackpot payout of the game other than progressive jackpot is 100000 coins per bet line. The game features Wild Symbol, Scatter Symbol, Free Spin Bonus Round andStock Market Bonus feature. The Wall St. Fever Sign symbol in the game is a wild symbol. This means that the Wall St. Fever Sign wild symbol acts as a substitute for other symbols to complete winning combinations. Multiple Wall St. Fever Sign wild symbols on an enabled payline create their own winning combinations. The Zigzag, and the Free Spin Bonus symbol in the Wall Street Fever video slot machine game are scatter symbols. This means that the Free Spin Bonus scatter symbol does not need to appear in a line on an enabled payline to win. The Free Spin Bonus scatter symbol can be scattered anywhere on the five reels to complete winning combinations, provided three or more scatter symbols appear. The Zigzag scatter symbols only appear on reels 2, 3, and 4. Free Spin Bonus Round is activated when three or more Free Spin symbols scatter anywhere on any reel .This feature can be reactivated during the free spins. The number of free spins player gets are decided by how many free spin symbols appears on reels. This game is triggered when the Zigzag scatter symbols appear on reels 2, 3, and 4 simultaneously. In this game player has to select the securities to sell in the stock market. This game is based on the theme of Share market and Wall Street, which is famous for stock market trading and is also known as the financial hub of the world. Wall Street is the home of the New York Stock Exchange, the world's largest stock exchange by overall average daily trading volume and by total market capitalization of its listed companies. All the graphics and reel symbols in the game are designed on the same theme. All symbols pay from left to right.